You will receive your test item supply every week. The supply contains the test items to be sent for the next week. The test items are already addressed. Please note that it is very important for the survey that you try to send the test items always on the planned date. If you are not able to send the test items on the planned date, please send them on the same weekday as planned in the next week. The letters need to be franked with regular stamps whereas the small boxes need a franking machine mark or an online stamp via the MTEL professional website. The needed value can be seen on the Posting list that is enclosed in the weekly supply. Please buy the appropriate tariff and put it on the letters. All postage costs will of course be reimbursed. small and large letters -> can be dropped into a mailbox on the street or sent via your post office. small boxes -> need to be sent from the counter at your post office with your carte pros. After you have received your weekly sender pack (test letter supply), please confirm the receipt in your online account before you start sending the items. 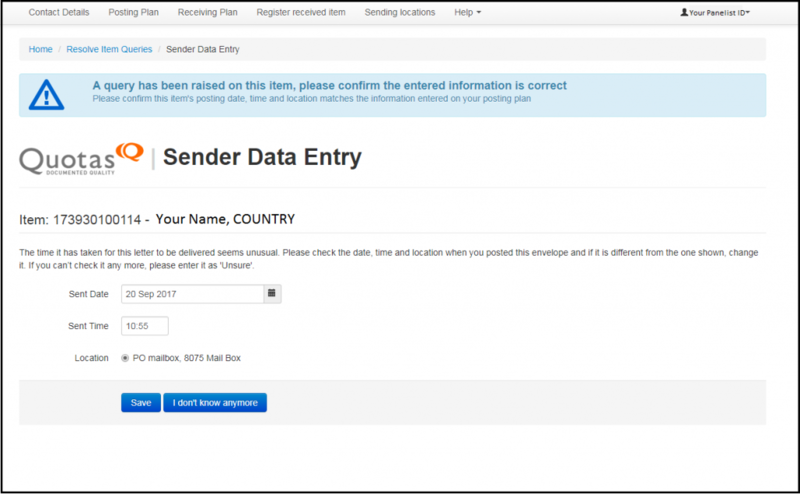 Please click on ‘Register Received Sender Pack’ and enter the planned posting date of one of the items in your received sender pack. Then click ‘Submit’. After you have sent the test items, please confirm the actual sending date in your online account. For the progress of the study it is very important that you enter the data the same day as you send the items. 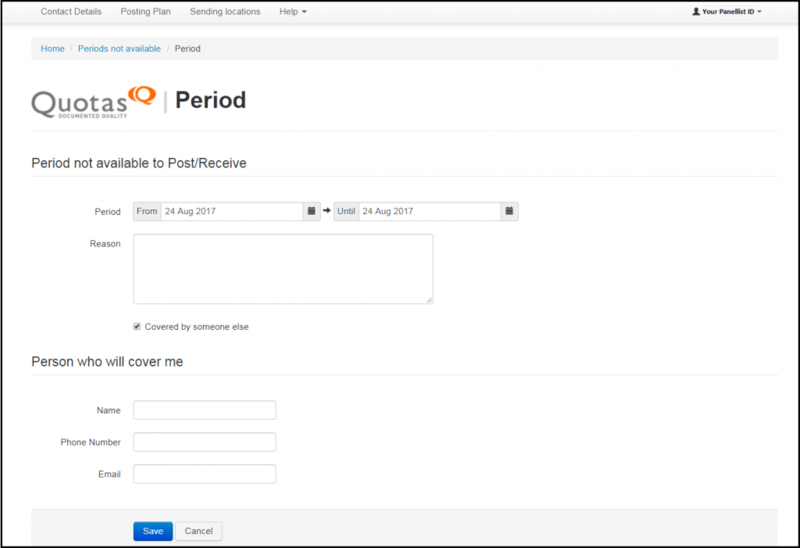 By clicking on ‘Posting Plan’, you will see the exact number and planned dates of your test items to be sent in chronological order. For entering posting information, please click ‘Send’. A new page will open, please select the ‘Actual Send Date’. If you happen not to send the item on the planned date you have got the opportunity to adjust it. Then enter the ‘Exact Send Time’ and select your ‘Sending Location’ and click ‘Submit’. To avoid mistakes, please enter the sending date only after having sent the test items. 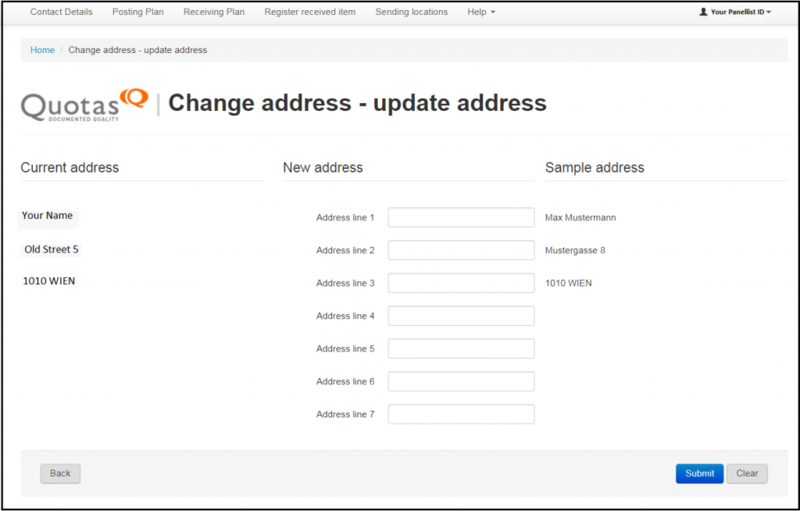 If you are not able to send your test items on the planned date, please enter the new actual sending date. Ideally you are available during the complete duration of the survey or you can delegate the task to another person in the case of absence or illness. Please inform us immediately about any duration when you won’t be able to send test items (e.g. change of address, absence, holidays,…). Now fill in the start and end date and the reason. If you have a cover who can do the tasks when you are not able to, please select the box ‘Covered by someone else’. A cover helps us to meet our target of sending a certain number of test items from your postcode area during the year in order to make our findings statistically valid. Anyone who is over the age of 18 can cover you as long as they can perform the tasks exactly as you do: receive the sending supply, sent out test items and enter data online. A family member, your house mate or neighbor, or someone who will feed your cat, for example, may cover you. They will need access to your house to receive the test item supply, and will need to send items from the same postcode area as you do. Please instruct them in detail and make sure they understand how to carry out your UNEX tasks before you go. If you do not have a cover, please make sure to inform us about your absence at least six weeks in advance. In this way we can adjust the production of test letters and you will not receive any test item supply when you are away. If the system tracks any irregularities in the data you entered, an item query will be raised. When you login to your Panel Zone, you will see a blue box. Please read the text carefully and click on ‘Resolve Item Queries’. 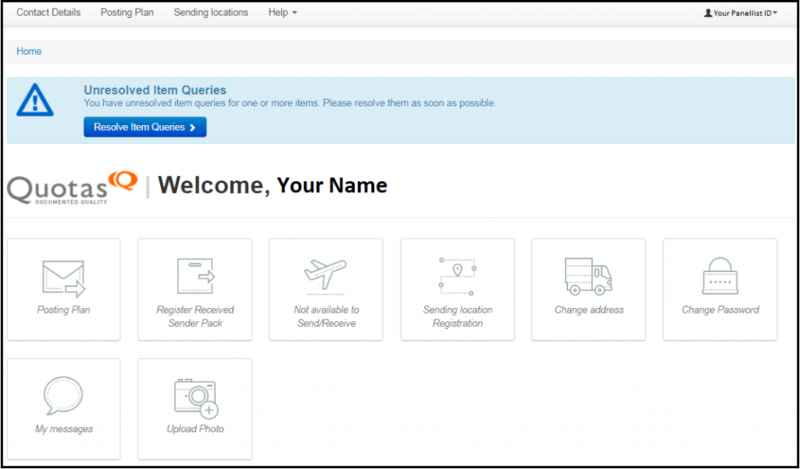 When activating your online account, you have already entered your sending location. In case your sending location changes or you want to add another one, please add the new sending location here. You can do this by clicking on ‘Sending location Registration’ and thereupon on ‘+Add’. 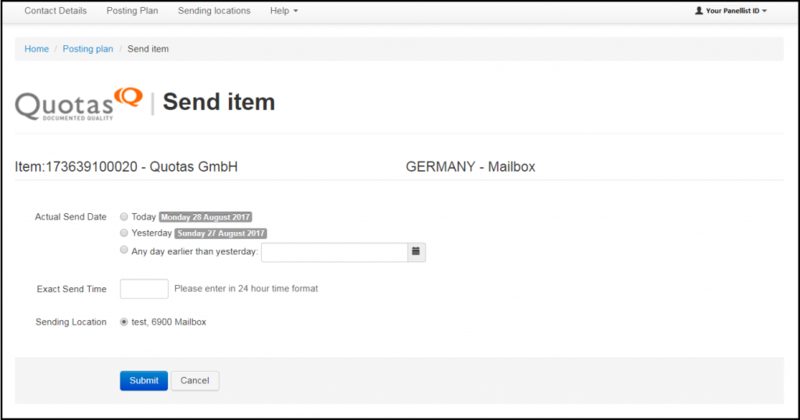 Please fill in the information of the sending point you will use to post your test items – you can add several sending locations, both Mailbox AND Post Office, even if the induction method is specified as ‘Mailbox’ resp. ‘Post Office’. Please note that you need both, a Mailbox and a Post Office, as the small parcels usually cannot be sent from a Mailbox. 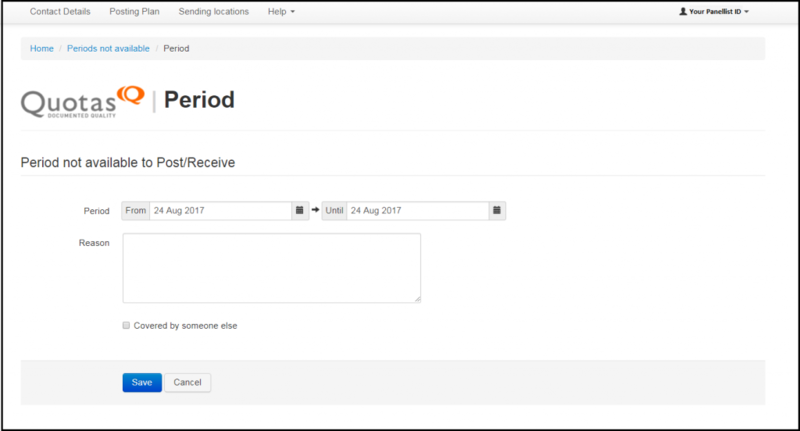 Simply fill in the description field (e.g. ‘Mailbox at the corner’; ‘Post Office near Metro Station’) and indicate the respective post code (if you are not sure about the post code, please use your postal operators website to research). Please also indicate the last collection time of your sending location. These times usually are displayed on the Mailbox or in the Post Office (please also check the ‘Possible Questions’ section below). If on a certain day (e.g. Sunday) there is no collection at all, please select the respective box. Once completed, please click on ‘Save’. If you wish to add another sending location, simply repeat the above mentioned procedure. If you are moving, please let us know at least six weeks in advance, so that we don’t continue sending test item supplies to your old address. It is easy to let us know, just click on ‘Change address’ and choose if you stay within the same country or if you move abroad. Please note: As a sender, you may need to set up a new sending location, in case your postcode changes. Of course we do not want to lose you as a participant in our survey. However, in case you need to end your participation, please inform us at least four weeks in advance. All test letters need to be produced several weeks before the actual planned send date. Therefore, we kindly ask you to send those remaining letters and enter the data online.